Based on the present and projected level of Gatun Lake for the following weeks, effective February 27, 2019, the maximum authorized draft for vessels transiting the Neopanamax Locks will be 14.63m (48.0 feet) Tropical Fresh Water (TFW). 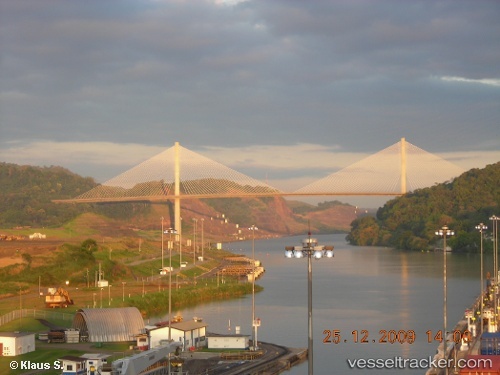 Vessels arriving with drafts over 14.63 m (48.0 feet) TFW may be allowed to transit past February 27, 2019, depending on the actual level of Gatun Lake at the time of transit. Otherwise, they will be required to trim or off-load cargo in order to be allowed to transit. Draft adjustments will be announced in 12 inch (30.5 cm) decrements, generally with at least four weeks advance notice. GAC - Wednesday, June 13, 2018, Panama Canal, Panama The recent rainfall in the Canal watershed has increased the levels of Gatun and Alhajuela Lakes considerably in the past few days. Therefore, effective immediately, the maximum authorized draft for vessels transiting the Neopanamax locks will be 14.94 meters (49.0 feet) Tropical Fresh Water (TFW). Vessels arriving with drafts over 14.94 meters (49.0 feet) TFW may be allowed to transit depending on the actual level of Gatun Lake at the time of the transit. Otherwise, they will be required to trim or off-load cargo in order to be allowed to transit. The maximum authorized transit draft is the deepest point of immersion in TFW permitted for a particular vessel in Gatun Lake. Water density of Gatun Lake is 0.9954 at 29.4 deg. C (85 deg. F). Vessels shall arrive at Canal waters with no list.